Falling police numbers are not to blame for rising violence but a new approach is needed, the home secretary has said.Writing in the Sunday Telegraph, Amber Rudd said evidence did not back up claims raised after recent shootings and stabbings in London that reduced resources were the cause of more crime. A government strategy to tackle serious violence includes a new Offensive Weapons Bill for England and Wales.Labour maintains the ability of police is affected by cuts to their numbers.More than 50 people have been killed in London since the start of the year and a woman was arrested on suspicion of attempted murder on Saturday night after a man was stabbed outside Highbury & Islington station in north London. In her article, Ms Rudd points out in the early 2000s, when serious violent crimes were at their highest, police numbers were rising. The home secretary said she was determined to end a "devastating cycle of violence" and the government's Serious Violence Strategy was the start of work to "radically change" how the problem is addressed. As well as introducing new laws and powers, Ms Rudd pledged to work with representatives from local government, health, education and industry to address the root causes of crime. 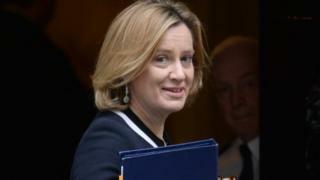 She said the drug trade would be highlighted as a "key driver" of rising violence and pressure would be put on internet companies to clamp down on the incitement and glorification of violence on social media.Ms Rudd described stop and search as a "vital policing tool" and said officers "will always have the government's full support to use these powers properly".She added the "time for political quarrels is over".Ms Rudd said: "Tackling violence on our streets is a complex problem, and we need not only all parties, but whole communities to come together to tackle it." The Offensive Weapons Bill will be brought before MPs within weeks.It proposes tough restrictions on online sales of knives - preventing them from being posted to residential addresses - and it would become illegal to possess in private certain weapons such as zombie knives and knuckle-dusters. The sale of the most dangerous corrosive products to under-18s would also be banned and there will be a consultation on extending stop and search powers to enable the police to seize acid from people carrying it in public without good reason. Other measures in the bill include making it an offence to possess a knife on a further education premises.Shadow home secretary Diane Abbott welcomed the proposed legislation but said Conservative cuts had undermined the police's ability to enforce the new powers. "The Tories need to put their money where their mouth is, give the police the resources they need to keep people safe and pursue a collaborative approach to tackling violent crime on our streets," she said.